Sixteen months after Appomattox the trustees of Colby voted to construct a library and chapel, to be known as Memorial Hall, honoring the College's Civil War dead. The building was financed largely by alumni subscriptions. The tablet above the lion, with its Latin inscription, identified the building as a memorial and listed the twenty Colby men who had laid down thier lives in the service of the Union. 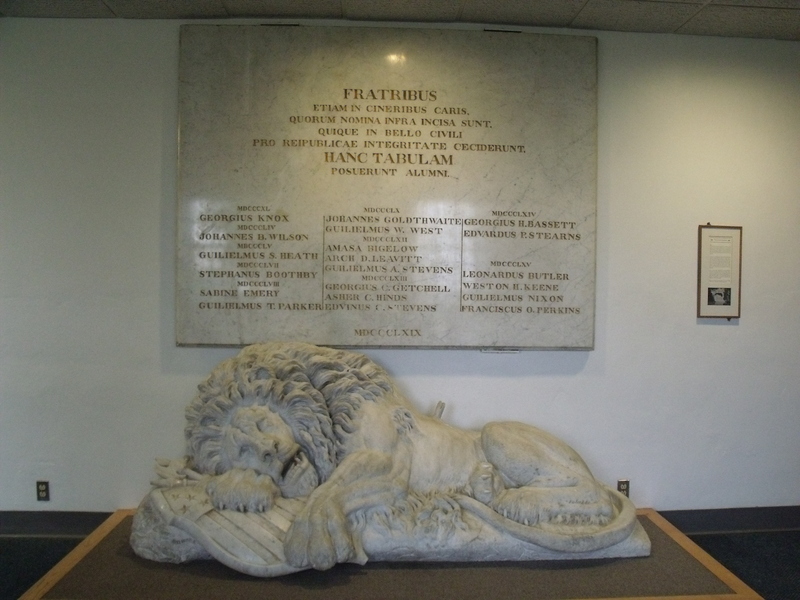 The Lion was mounted above the table in the Seaverns Reference Room of the library on the old campus. It is a marble replica of a well known work in Lucerne, Switzerland, by Danish sculptor Albert Thorwaldsen. The original, colossal in size and placed in a niche carved our of solid rock, celebrated the fidelity of a regiment of Swiss guards who died in 1792 in Paris in defense of Louis XCI and his family under the attack of revolutionaries. The design represents a lion pierced by a spear, protecting in the agony of death the national emblems of France and Switzerland. Henry S. Burrage, M.D. of Portland, the noted Maine historian and trustee of the College, conceived the idea of using a replica of the Lion as a memorial at Colby. At his suggestion Professor Charles E. Hamlin discussed the plan with Martin Milmore, a distinguished Boston sculptor. It was enthusiastically received by Milmore, who suggested that the shield of the United States by substituted for those in the original. The Lion was dedicated at commencement in 1871. It was brought to to Miller Library from Memorial Hall in January 1962.